I had my father get tested and it's fairly accurate. He's an ethnic Punjabi of the Jat caste and Sikh background. I've checked my dad's family tree and they can confirm all of his great grandparents names and a few great great parents but certainly everyone is accounted for from at least around the 1830s prior to the British conquest of the Punjab in 1849. The 87% central Asian is all North Indian which is no surprise and I was initially confusing as outside of FTDNA, Central Asia is considered to be the ex-Soviet Asian republics like Kazakhstan rather than Northern India & Afghanistan. I imagine the 13% "European" component is just a broad estimation that isn't so common outside of Europe but not necessarily exclusive either. It was fun checking the raw data as well, it turns out he's got a recessive allele for blue eyes as well as an snp for green eyes, though no one in his immediate family have them. The ancient origins page is a little confusing as he's apparently only 12% non-European on there. Once raw data is out, will upload it to third party websites as I don't find the above breakdowns any useful. ​​​​​​I identify as 100% Southern Han Chinese as all my grandparents were "natives" to the Southern China, each of them identify as Han. But I look a bit like Southeast Asians so I thought I might take this test to find out my hidden ancestry. Maybe there's hidden Indian or Southeast Asian ancestry (Indian and Chinese offsprings look like Southeast Asian). As result came back 62% Southeast Asian, I finally found my hidden ancestry, right? Only if you think Southeast Asian here means anything south to China, from Thai to Indonesia. But it seems like FTDNA do not follow the traditional ethnic breakdowns, they have their own definition of ethnicities. East Asia for them means anywhere from Siberia all the way down to Indonesia. Southeast Asia for them includes Southeastern China. Oceania is South Asia and North India is Central Asia. It seems like their definition is everywhere. So I am not sure what they mean by Southeast China. Traditionally it means Fujian, Guangdong and Hainan, but since they love to create their own definition, it could be anything. So the conclusion is I learn nothing from this. I still do not know if I am 100% east asian or have some mixture of Southeast Asian DNA. The only thing I can rule out is not having South Asian DNA. Last edited by Romsus23; 20th February 2019, 11:09 AM. Thank you for the explanation. Very interesting indeed. How did you arrive at 1.7%? I averaged out my Oceanian result on select Eurogenes calculators. I don't know if that's the "correct" way to arrive at an estimate but it seemed appropriate at the time. I haven't seen any other Maori/Polynesian people on this forum so I take it those who are and test are rare. I'm starting to see my genealogical ancestry and genetic ancestry are slightly different. A 5th great grandmother on my maternal great grandfathers side. On paper I'm 1.7% Maori but on Gedmatch calculators I don't average more than 1.2%. I get more eastern Mediterranean in general and because of that I reckon I'm more Middle Eastern than Maori, which is odd but I guess that's how autosomal DNA works. My sister doesn't even average 1% Maori. I thought I'd add mine My known ancestry on paper is English, Scottish, Welsh, Irish, Croatian, Polish and Maori. There is also Jewish ancestry on my maternal grandfathers side. The high amount of Scandinavian was a surprise and makes me wonder if it is just because of that DNA being mixed in with my more recent Irish and Scottish lines so much, or actually possibility of some Viking or Norwegian farther back on a line or two?? There is no southern European in the past 300 years, so that was also a surprise. ancestry is : 92-94% UK&Ireland, 6-8% Western Europe (esp. German and French). I'm not ruling out some small percentage from some unknown Scandinavian ancestor that I can't figure out, but my guess is that it is simply that the particular British Isles mix I have happens to include a bit more Viking than some and/or my bits of French and German might be throwing the predictor a bit east and south. Family Finder has provided me with a possible clue in the form of "mystery matches" that I think might be related to my unknown. That's why I revised my UK % upwards a bit. 85-90% UK&Ireland (all over, but weighted a bit more heavily in areas like SW Scotland and Yorkshire,England), 5%-10% assorted western Europe (known immigrants from southern France and from southern Germany), and some very small percentage like 1-5% Amerindian (paper trail says 7xgrandma and possibly 6xgrandma on same line that I am descended from twice - and my unknown lines are also married into this basic branch of the tree, which is why I put such a wide range for the guess). So, as it turns out, my unknowns must be European, and maybe contributed something to my Scandinavian and/or Southern Europe elements ? The y-dna family project for the possible Amerindian descent brings up some real questions,too. About half the people who list a specific male progenitor don't match the other half, so it's very possible my paper trail is one of the half that is wrong. 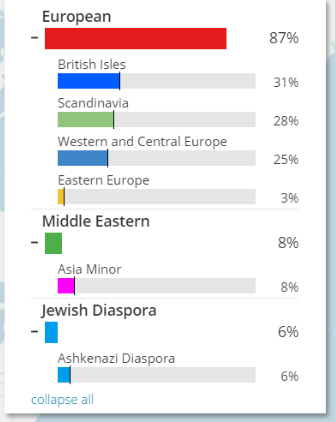 MyOrigins gives me results which are not surprising in any way. I have about 1000 known ancestors in my family tree, all of them Finnish, and great majority of them Western Finnish. Despite the historical documents have not shown me any Scandinavian ancestors, I do have plenty of FF matches from Sweden and Norway. Also, both my Y-DNA and mtDNA haplogroups (I1-L1302/H4a1a4b) and matches point to West or Southwest from Finland. I feel like the most genetically boring person on this thread, lol. Still waiting for my Gedmatch information to process, will likely post my results from there here too.